Wangdrak Rinpoche will return to Australia in March 2019 to lead two 3-day introductory retreats, and a 7-day senior retreat. Cost: $620 residential for four nights with vegetarian meals – bedding and towels are provided. There is no charge for teachings but cost covers retreat expenses and offerings to Rinpoche and the translator. Registration: A registration form with further details must be completed and returned to secure your place. Download your registration form here. Contact: gebchakretreats@gmail.com or phone: Lynette 0423756722, Sarah 03 95964909 or Claudio 0425842233. Reservations cannot be made by phone or email. In this introductory retreat Wangdrak Rinpoche will give an overview of the stages of meditation training followed by dedicated practitioners in Tibet (particularly in Nyingma and Kagyu practice lineages). He will briefly introduce the Tibetan approaches of Shamatha & Vipashyana, yidam deity yoga, up to the most direct meditations to ascertain emptiness as the nature of the knowing mind. 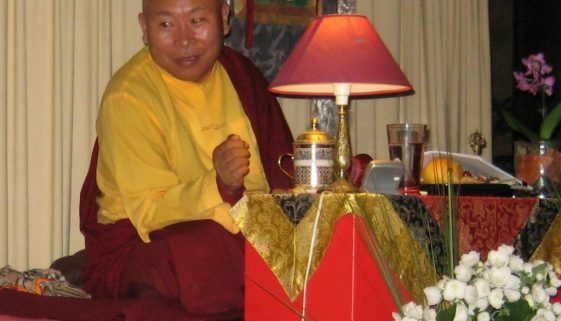 In giving this overview Rinpoche will highlight the principle of Buddha Nature that underlies the Tibetan Vajrayana path, and thereby help students to enhance whatever their regular meditation may be. Brahma Kumaris Centre for Spiritual Learning, Frankston, is a peaceful oasis of gardens and bushland. Accommodation is in comfortable twin rooms with en suites. The rooms look out over serene gardens and bushland surrounding the meditation center. The center is 60 minutes from Melbourne accessible by car and train. Gebchak Rigpa Har-Sey thanks Brahma Kumaris Australia for making their retreat center available to them for this retreat. Cost: $495 (no charge for ordained sangha) residential retreat for three nights. 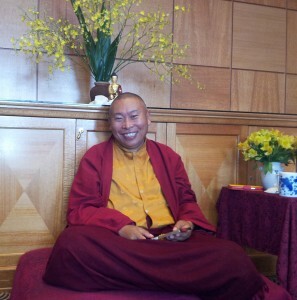 There is no charge for teachings but cost covers retreat expenses and offerings to Rinpoche and the translator. Contact: gebchakretreats@gmail.com or phone: Norbert 0475243249 or Margaret 0432858139. Reservations cannot be made by phone or email. Brahma Kumaris Centre for Spiritual Learning, Leura, is located on 132 acres of rugged bushland. The architectural design creates a soothing atmosphere, conducive to meditation. Enjoy walking down to the heritage stone cottage, set among English-style gardens and discover crystal clear water cascading over rocks. Accommodation is in comfortable twin rooms with en suites and the dining room overlooks magnificent valley views. The Centre is 90 minutes west of Sydney, accessible by car and train. Gebchak Rigpa Har-Sey thanks Brahma Kumaris Australia for making their retreat center available to them for this retreat. Venue: Karuna Sanctuary Retreat Center, Saywell Rd, Katoomba, 2780. The center is located in 374 acres of bushland close to Katoomba and is accessible by train and car. We may be able to walk to the cliff top one morning for meditation. There is shared accommodation – rooms and bathrooms – in railway carriages or in the main building. Pre-requisites: This is the fourth in a series of progressive retreats given by Wangdrak Rinpoche in Australia. It is essential that participants have completed one 7-day retreat or two 3-day retreats with time in between to follow Rinpoche’s practice instructions and Ngondro accumulations from any tradition (further information below). Cost: $980 residential retreat for 8 nights with vegetarian meals. No charge for ordained sangha. There is no charge for teachings but cost covers retreat expenses and offerings to Rinpoche and the translator. Tsangyang Gyamtso was the founder of Gebchak Gonpa and a remarkable yogin of the late 19th century, praised in the writings of his contemporaries Dza Patrul, Ju Mipham and Jamgon Kongtrul Rinpoches. This teaching was given by Tsangyang Gyamtso as a pith instruction to the many Gebchak nuns and male yogins who were his disciples. It covers the View, Meditation and Conduct on the path of Vajrayana practice, and is a beautiful glimpse into the non-sectarian attitude of the Rimé era in which Tsangyang Gyamtso lived. 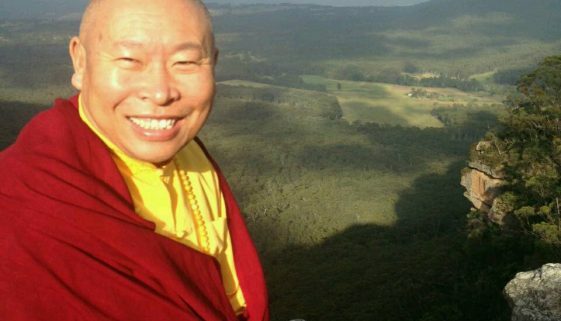 Wangdrak Rinpoche offers retreats in Australia roughly every 18 months. His teachings follow a natural progression and deepen from one retreat to the next. To fully appreciate the nature of Rinpoche’s teachings, it is necessary to integrate them into one’s daily life through regular practice. These retreats are not stand alone, but based on the previous retreat and one’s own regular practice experience. The retreats are open to everyone. However it is required that before attending the 7-day “senior” retreat one should have attended a least two 3-day retreats, and have practised Rinpoche’s instructions for at least one year in between. In the 3-day retreats, Rinpoche maps out the whole path from the initial motivation through Shamatha and Vipashyana, Generation and Completion Stages of the Vajrayana, culminating in Mahamudra and Maha Ati. One gets a glimpse of the journey ahead, and can decide to embark on it, or simply leave it there. If one decides to follow on, as stated above one needs to commit oneself to regular daily practice, and embark on accumulating 50,000 of each Ngondro (of any lineage), unless one has already done so (of course it’s also possible to do them again). There is no time limit for completing the Ngondro; they can be a lifelong cultivation to support deeper insight in your meditation. Most important is your motivation in doing the Ngondro. They are not some test or rite of passage, but practices that clarify one’s intention, remove psychological and other obstacles to spiritual progress, accumulate positive energy or merit, and open oneself to the blessings of the lineage. It is rare to meet a genuine Master who holds an authentic lineage of realisation. Also rare is the opportunity to be introduced to such a lineage and be taught its essential practices. This is the reason for having in place certain requirements before attending the 7-day retreat. It is precious and not to be embarked upon in a casual manner. Wangdrak Rinpoche was recognized by Sakya Trizin as the reincarnation of Wangdrak Dorje, one of the early lamas of Gebchak Gonpa who worked to provide women with the same opportunity as men to train in the Buddhist path. At the age of nine Rinpoche began his monastic education in the Kagyu, Sakya and Nyingma traditions, later receiving the Khenpo degree in Buddhist philosophy at the non-sectarian Dzongsar College in Tibet. As a Lama of Gebchak Gonpa, Wangdrak Rinpoche is committed to the spiritual and material welfare of over 350 nuns in Eastern Tibet who are renowned for their devotion and profound practice of Vajrayana yogas and meditation. Rinpoche is currently developing a retreat hermitage in Nangchen, Tibet as a training hub for Gebchak lineage nuns and monks, as well as for international students. He regularly visits his students in Singapore, Malaysia and China, and visits Australia roughly every 18 months to lead meditation retreats. Elizabeth McDougal (Tenzin Chozom), Rinpoche’s translator, is a Canadian who lived as a Tibetan nun in India and Tibet for 18 years. Elizabeth has been Wangdrak Rinpoche’s translator and project coordinator for 13 years and has Masters’ degrees from Banaras and Sydney Universities. She is now a PhD candidate at Sydney University doing fieldwork-based research on Nangchen’s contemplative culture. *If you wish to make a donation – however small – to assist those cannot attend a retreat for financial reasons, please make your donation to the Gebchak Retreats bank account and email gebchakretreats@gmail.com. If you are unable to attend the retreat for financial reasons, please email us as we may be able to work out assistance or payment instalments.